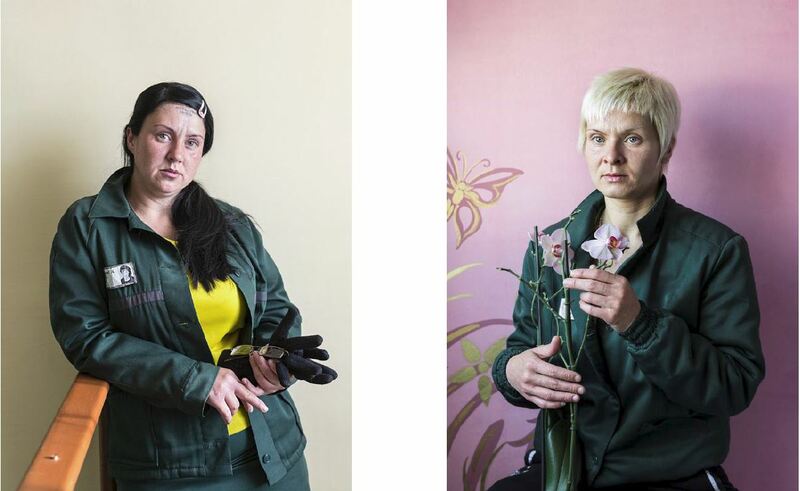 Elena Anosova, a second year stu­dent at the Rod­chenko School of Pho­to­graphy and Mul­ti­me­dia, spent 2 months liv­ing and work­ing in three Rus­sian female penal colon­ies, explor­ing the inner world of the inmates based on her own child­hood exper­i­ences of liv­ing in a closed rehab­il­it­a­tion school. The res­ult is a strik­ing series called ‘Sec­tion’ that reveals how being in con­fine­ment and under con­stant sur­veil­lance dis­fig­ures and trau­mat­ize a person. The story begins in the colony for first time offend­ers and then moves to colony for repeat offend­ers and a set­tle­ment colony. Both young girls, who are still quite uncer­tain about their future in the first time offend­ers colony and women who have been marked by being jailed sev­eral times in the repeat offend­ers colony present them­selves in a way that changes the viewer’s idea of life in prison. “I came there as an artist, because I wanted to answer some ques­tions about my child­hood. But there was also a shift in my per­cep­tion of these women as time went by, and I real­ized I wanted to bring atten­tion to the social prob­lems that these women face,” Elena explains as she revis­its her exper­i­ence dur­ing this project. The Rus­sian pen­it­en­tiary sys­tem doesn’t have an effect­ive infra­struc­ture needed to sup­port people who are released from jail. This is espe­cially hard for female pris­on­ers because crimes com­mit­ted by women usu­ally are the res­ult of years of viol­ence towards her or her chil­dren. They are deeply scarred both psy­cho­lo­gic­ally and socially and are labeled as ‘crim­in­als’. Most of them, once enter­ing the sys­tem, are forced to com­mit con­sequent crimes because when released, they have no means to find a job or fit in a soci­ety. ‘Sec­tion’ was awar­ded the granв prix of the Andrey Stenin Inter­na­tional Com­pet­i­tion for Pho­to­journ­al­ists, and won the doc­u­ment­ary prize at the Baltic Bien­nale for Photography.